Murchison gold that averages at 94% Au (93-97%), 4% Ag, Fe 2% ( possible traces of Cu & Pt ). The voids and sheltered areas retain a lot of fine detail of the original quartz and gold structure. This nugget has only been lightly brushed in water thus retaining materials that acid will remove so as to verify the authenticity of this gorgeous earth treasure. This intriguing 'lion head' like nugget has multiple imagery and is relatively flat and of even thickness throughout its contours. The nugget is integral and is suitable to be mounted from any point making it ideal to be crafted into a jewelry piece which is further enhanced by the fact of its considerable size and yet weighing just under 1/3 ozt. Australian Reef Gold Nugget 16.30g. Sent with Australia Post Pre-Paid Parcel Post Satchel 500g. AUSTRALIAN NATURAL GOLD NUGGET EARRINGS. Made with 9ct gold clasps. The gold weighs 0.8gms. Sent with Australia Post Pre-Paid Parcel Post Satchel 500g. Natural Gold Nugget from Western Australian Goldfields. 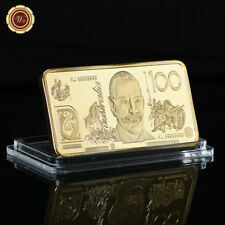 Founded on May 4, 2011, we are one of the biggest gold banknote and coin manufacturer in China. Have hundreds of banknotes and coins. Material: Iron, Gold Foil. Size: 50 28 3 mm. CompositionIron,Gold Foil. Vial full of Gold Leaf/Flake Finger Nail Art, Scrap-booking, hobby, bling, gift. You are buying 1 x Vial full of Gold Leaf/Flake Finger Nail Art, Scrap-booking, hobby, bling, gift. 50 mm Capsule full of Gold Leaf/Flake Finger Nail Art, Scrap-booking, hobby. 45 mm Capsule full of Gold Leaf/Flake Finger Nail Art, Scrap-booking, hobby. Uncirculated Gold Coin. This coin is 22 carat gold.